Published by Joshua Clare-Flagg on 17 Sep, 2015. 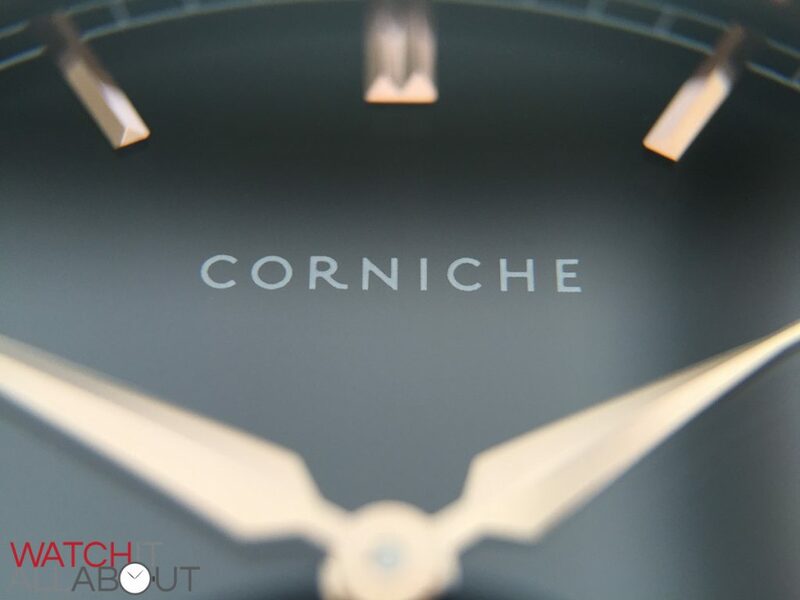 Corniche have been on my radar for almost a year now, I’ve always felt that they’re well designed, and seem to have a keen eye for detail. I was happy to oblige when they offered to send one for review. The Corniche Heritage 40 will cost you £230, and I’m pleased to say that I was right in the eye for detail front. Hailing from Sweden, they have a really nice site (always a good start) and it’s obvious to see that their main focus it on materials and details. Let’s take a closer look to see why this is the case, and if it’s a good buy at this price. First off, the whole opening experience is a real joy. It’s easy to say that I’ve never received a box and extras like this on a watch of a similar price. 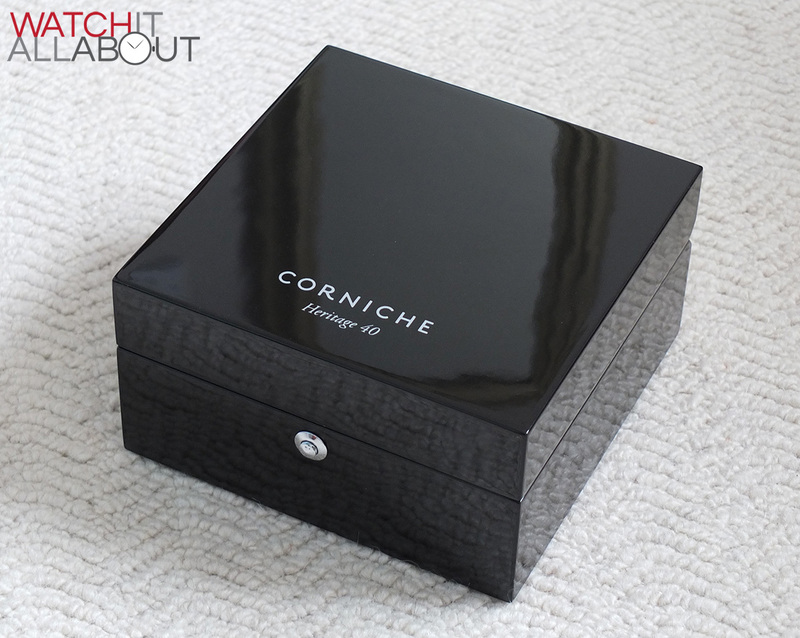 It comes in a delightful piano lacquered wooden box, with chrome hinges and release button. This is within a pleasant cardboard box and wrapped in a velvet cloth. 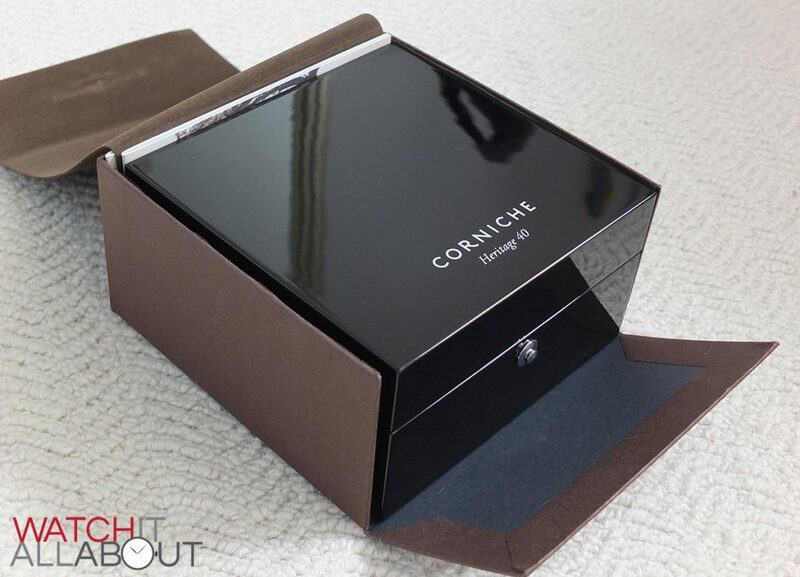 The box is pleasantly large too, and will happily look the part sitting on the side in your bedroom. There are also two booklets; the certificate of authenticity, and the instruction manual. Both are very well designed and give the feeling and look of a more luxurious and expensive brand. An excellent start for the Swedes. 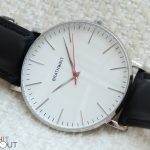 The caw measures 40mm in diameter, with a slender height of 7mm. Just the right size to me – small enough to look right in all situations, and large enough to provide a good measure of wrist presence. The case is well machined, and is finished nicely too. The top and bottom are polished, whilst the sides are brushed, which breaks up the case pleasantly and makes it attractive and interesting. The Corniche Heritage 40 houses a sapphire crystal. Obviously it’s something that’s expected on a watch of this price so I’m happy with that. I have found, though, that it’s easy to get finger prints and smudges on, more so than other crystals. I’m not sure what it is about it, but it is worth mentioning. There doesn’t seem to be a layer of anti-reflective coating, so it’s quite reflective too. 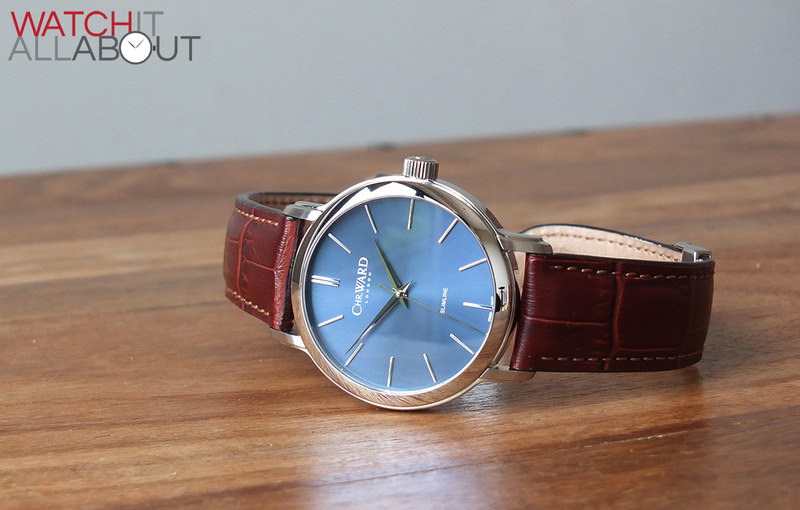 The shape of the case is simple enough, being a classic barrel with shapely, curvaceous lugs. 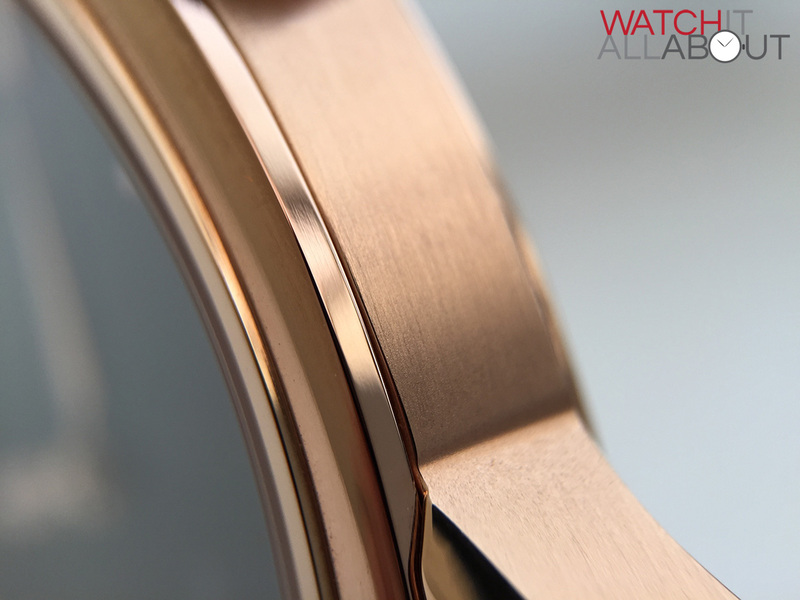 The lugs are curved a decent amount, resulting in the watch hugging the wrist, delivering a comfortable wear. The crown is small and simple, with gentle grip. 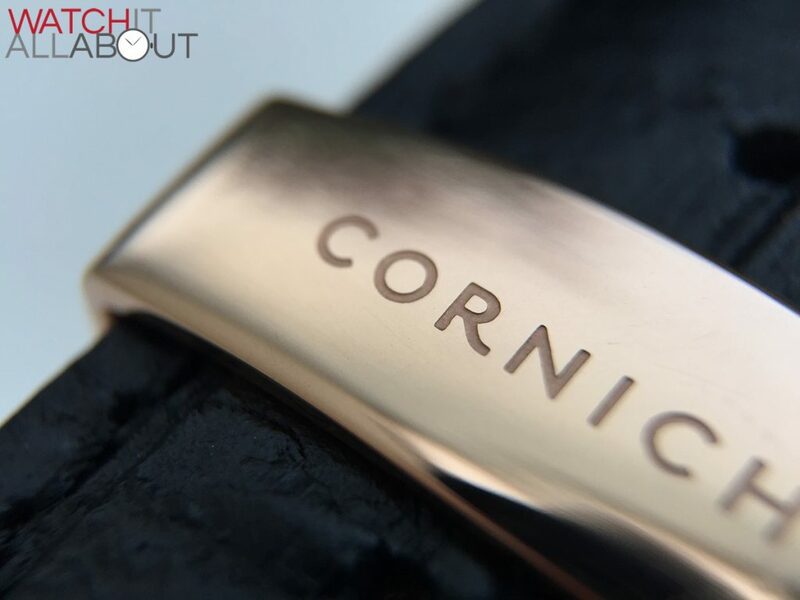 The end is polished, with the Corniche “C” embossed on it. Whilst it’s lovely to look at and pleasingly compact, it can be a little tricky to pull out – for the most part it’s sunken into the side of the case. The only way to extract it is by getting your nail under the thin gap on the underside. 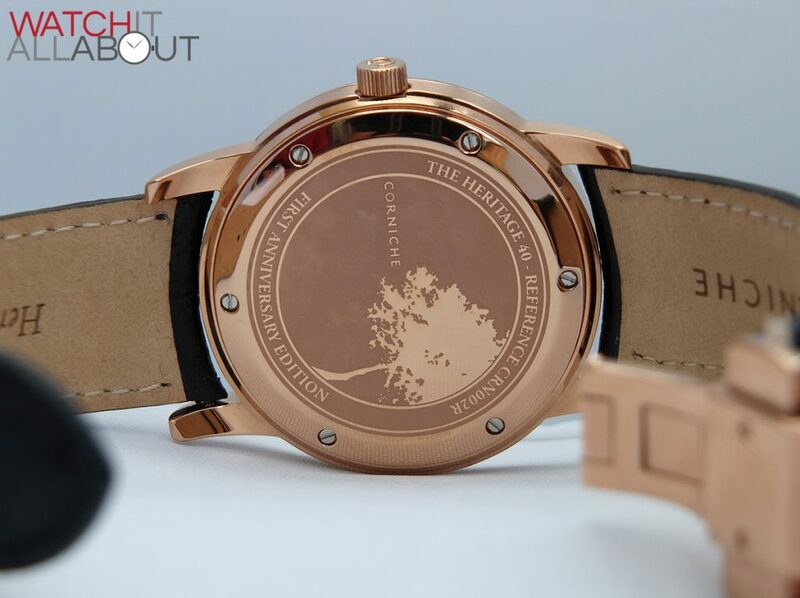 The caseback is rather charming; featuring a Mediterranean pine tree – the view of which, sort of personifies Corniche and what they’re aiming for. 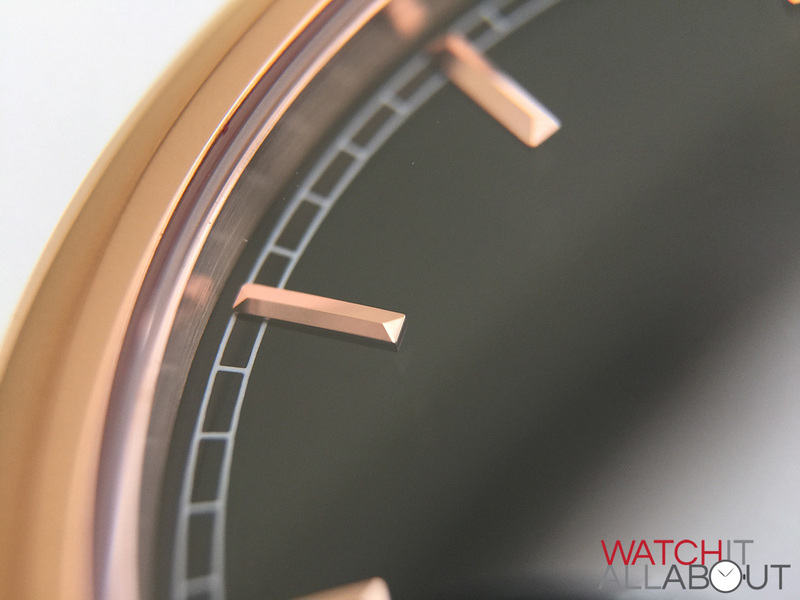 The caseback is secured in place with 6 polished screws, and a couple of pieces of information can be found above and below the motif. 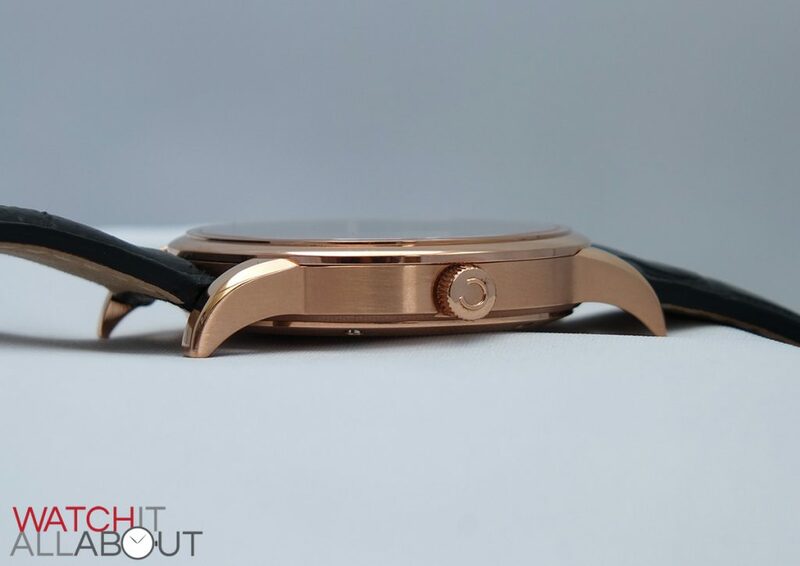 The finishing of the caseback is good and a little tricky to get right too – all the markings are raised and polished, based upon a matt finish. Not always easy to get right, but they have. The case has a 50m water resistance, which means it’s suitable to go shallow swimming in. The case in essence is simple, but has a few little aspects that are thoughtful, keeping it interesting. On the whole, it’s very well machined and finished – so there’s really nothing to complain about whatsoever. In fact, I’m pretty impressed by it. 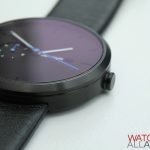 The dial is available in black or white, and a rather impressive key feature is that it’s made of ceramic (like a tile). This provides a lovely reflective surface that still has depth and colour. The applied hour markers are done so by hand, and sit happily in position, with a light reflection surrounding them due to the surface. These batons are all pitched and made with striking accuracy – they’re cut extremely straight and all angles are definite. 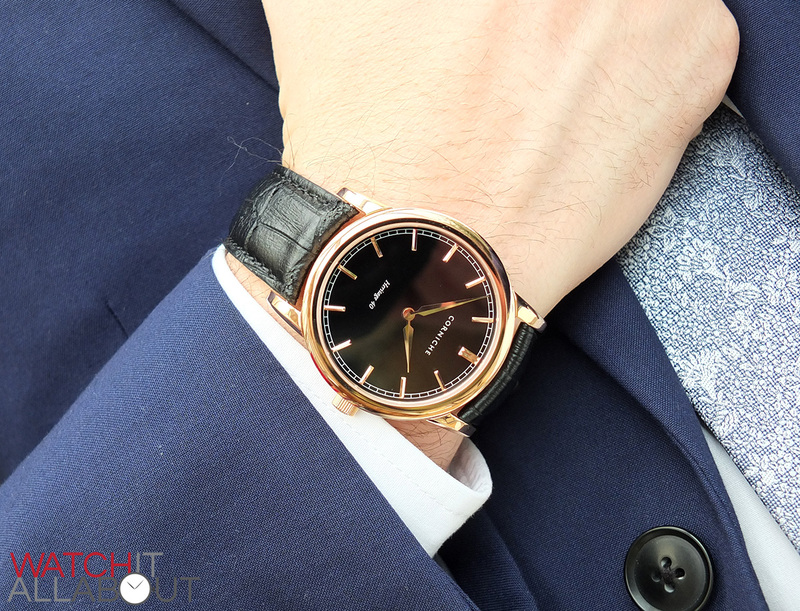 The gold plating is polished, which reflects the light pleasantly, and it matches the case and hands well. 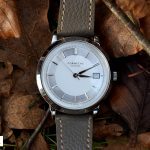 The printing on the dial is very fine and precise, and actually offer surprising readability considering the reflective nature of the dial itself. The print has been kept simple and to a minimal; with only a rail track style minute track around the outside, the logo in the top half, and Heritage 40 in the bottom half. The dauphine hands are pitched, and you’ll only find two of them – there’s no second hand in sight. 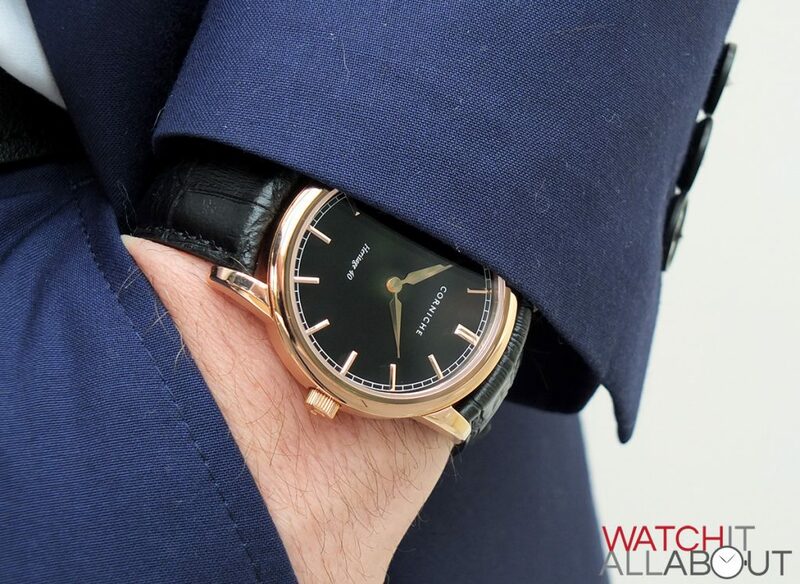 Either blued on the white dial, or gold on the black dial; in my eyes they are the perfect length: hour hand to the base of the hour markers, and the hour hand stretching right out to the edge of the dial. They’re also the correct thickness, good legibility mixed with elegance. 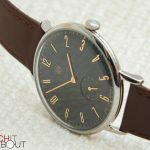 Looking at it from afar, the dial is a rather simple design, but it is made very well for the price of the watch – it is spotlessly executed. The gold on black also delivers very well on the legibility front. 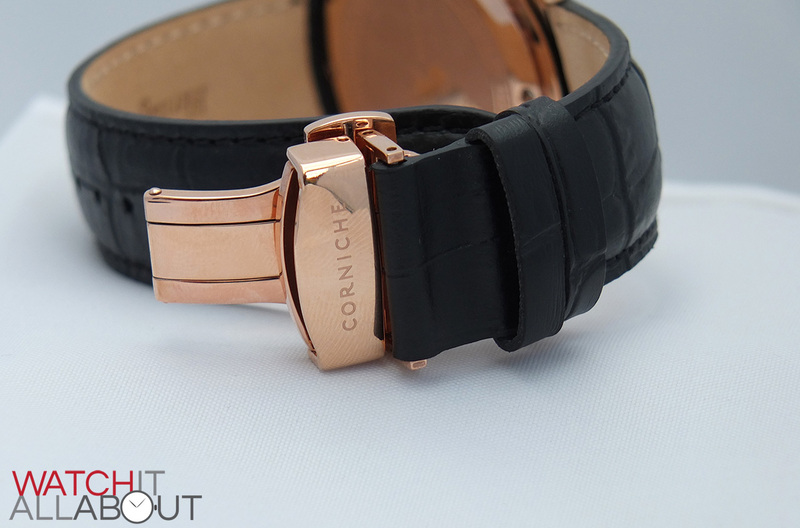 The strap measures 22mm at the lugs, reducing to 20mm at the clasp. 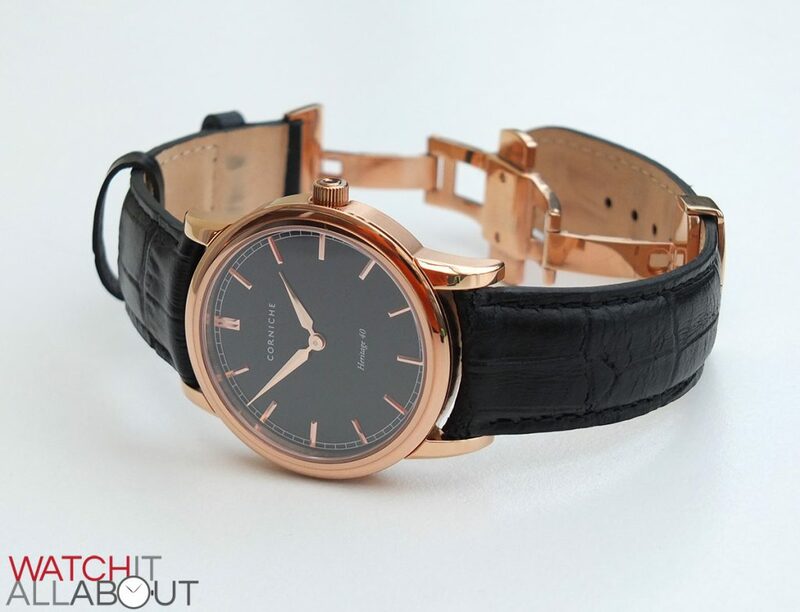 The leather is a matt, soft and gentle black, which offsets well against the rose gold case. All stitching is black to match the top, and is neat and solid. 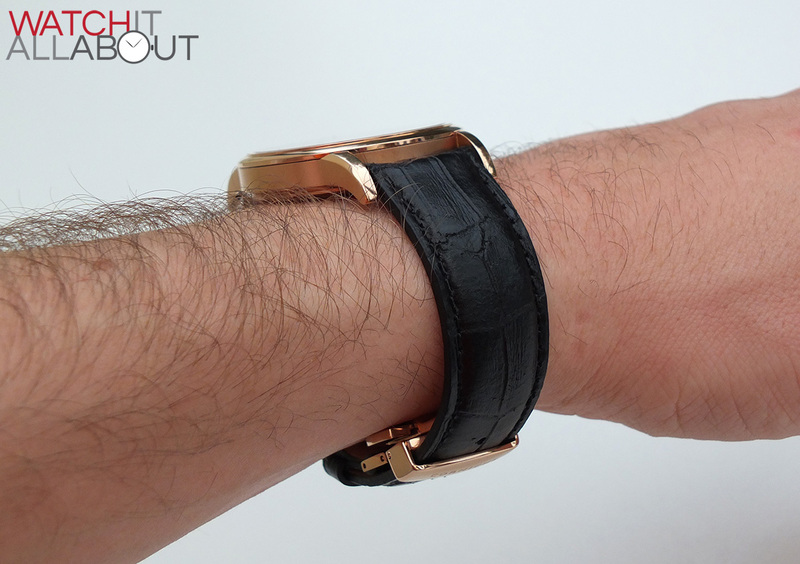 A soft, tan underside with matching creamy stitching means it’s comfortable on the wrist, and looks smart too. 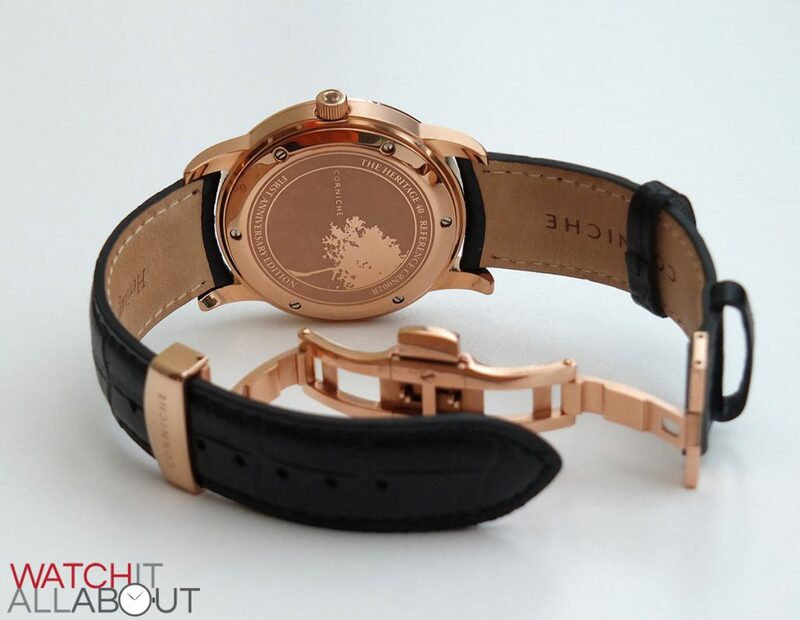 The strap features the words “Corniche” and “Heritage 40” stamped on the two sides. Whilst the leather quality is excellent, the strap is the source of my only complaint with the Heritage 40. On the bottom lug, the width is not quite 22mm – it’s more like 21mm, so there’s a slight gap between the edge of the strap and the lug. I’m sure it’s a one-off and I’m also certain that this would be rectified quickly and easily, but it was also worth a mention. 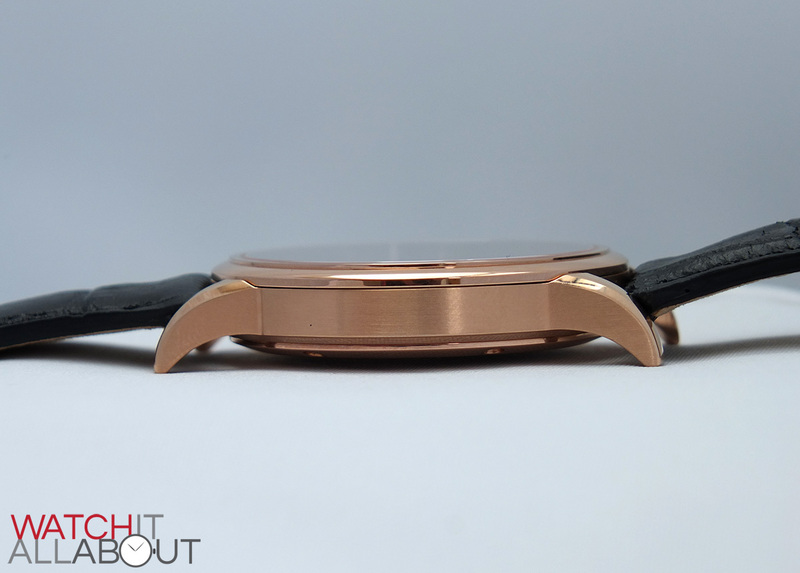 The rose gold butterfly clasp is splendid in its appearance and build quality, which is as well finished as the case. It’s all polished bar the very inner section which has some pearlage which is a nice touch. The top bar is not a flat straight shape, but rather has a gentle sweeping top to it. 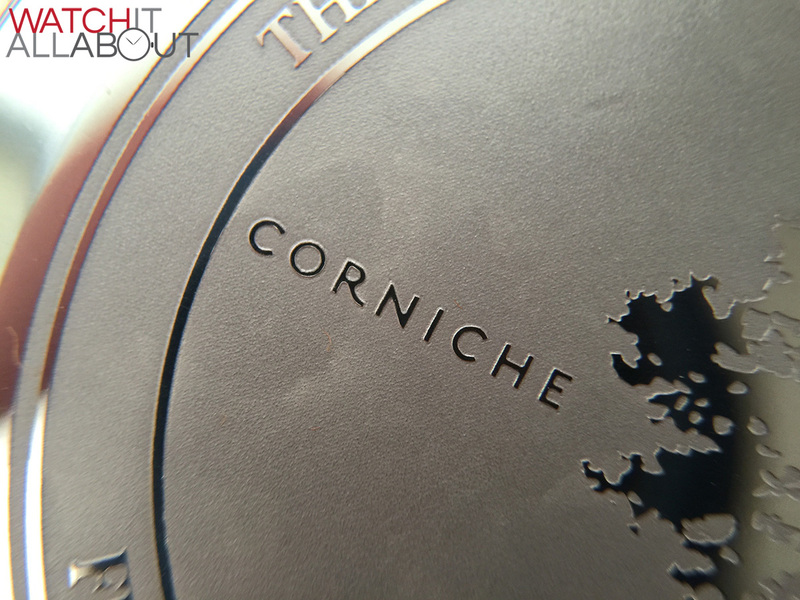 The Corniche logo is deeply engraved on it – much better than the laser etching you’d likely see on other watches. Because it’s exposed, this bar picks up hairline / desk roving scratches easily so just be aware of that. 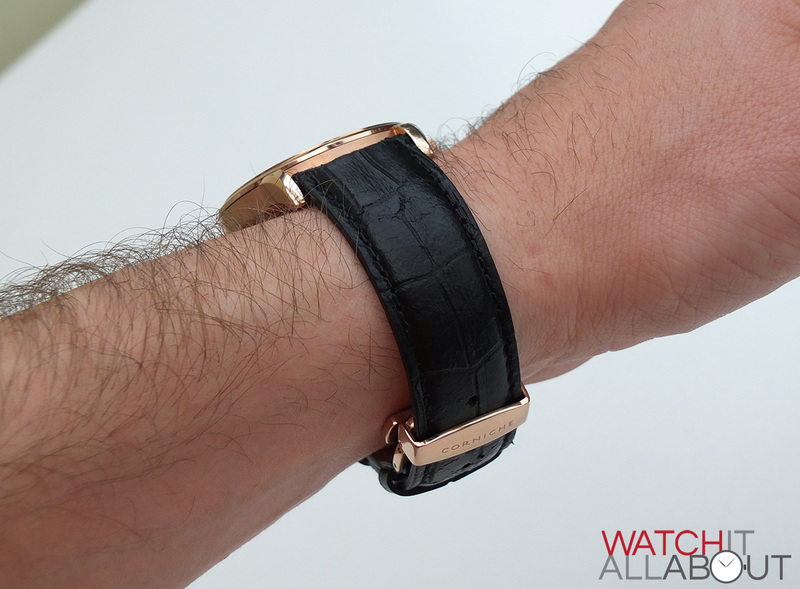 The strap is just another surprisingly impressive aspect of this watch that I’m really starting to like a lot. 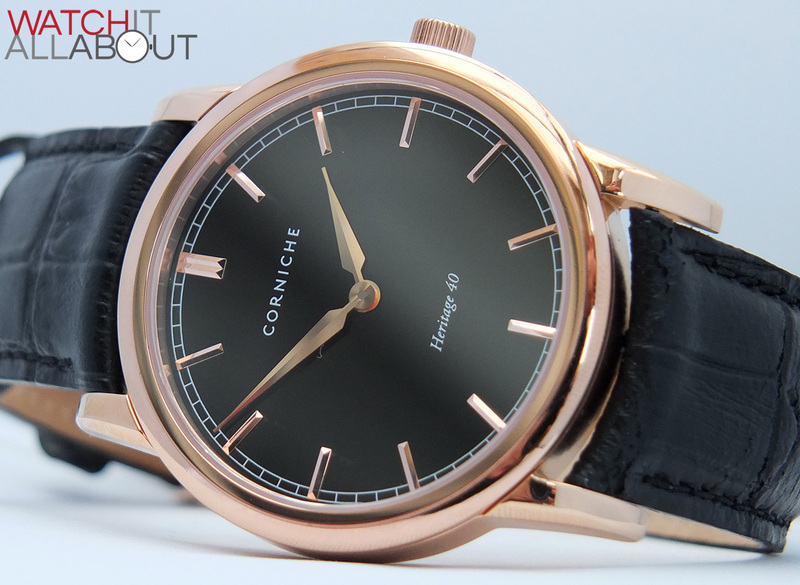 Powering the Corniche is the Miyota 2025 quartz movement. They’ve made a nice decision to omit the second hand, so no one will ever know if it’s Quartz or mechanical unless they find out by asking or viewing the site. The 2025 is a pretty standard, uninspiring movement – its specs include 0 jewels, 3 year battery life, and +/- 20 seconds per month accuracy. 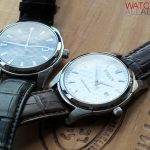 Let’s be honest, all Quartz movements are solid enough nowadays, and although they aren’t particularly inspirational, they all do a great job at what they’re made for – keeping good time. Miyota are especially good at this, having a reputation of making reliable, affordable movements. 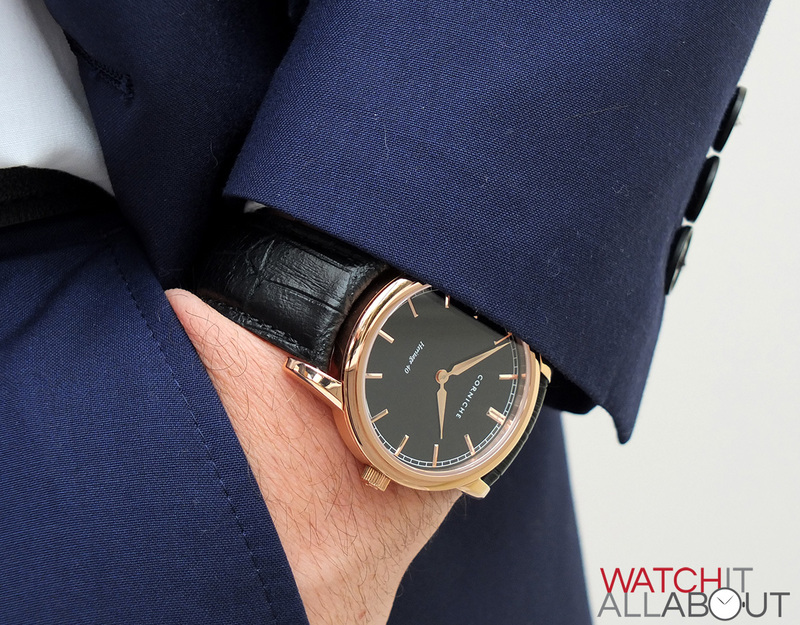 One competitor that springs to my mind is the Christopher Ward C5 Slimline. 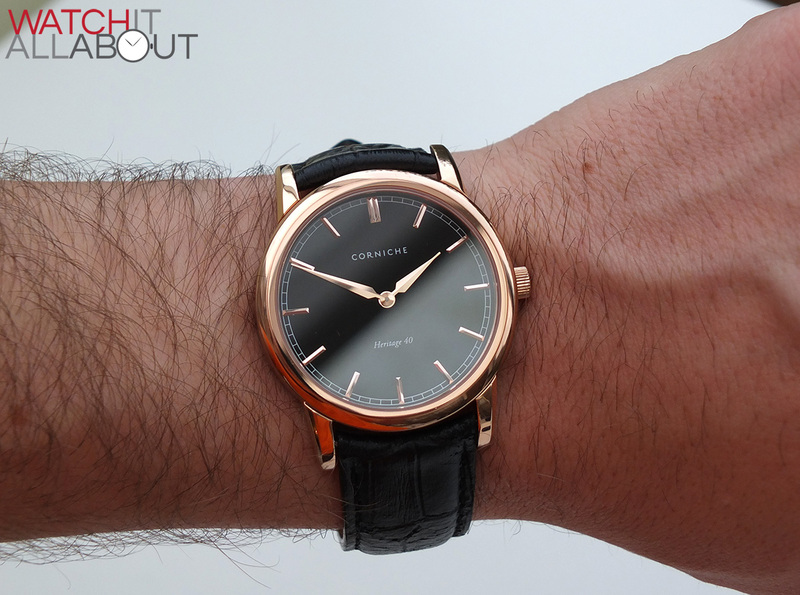 With classic looks, slim case and dauphine hands it’s very similar in appearance. It’ll cost you almost double the Corniche at £400, but it is Swiss Made, and has a beautiful ETA 2801-2 hand wind mechanical movement. So you’re still getting a lot for your money. For £230, I must say, the entire package is very impressive. From the moment you open up the cardboard box, you realise this is quite the watch for the money. 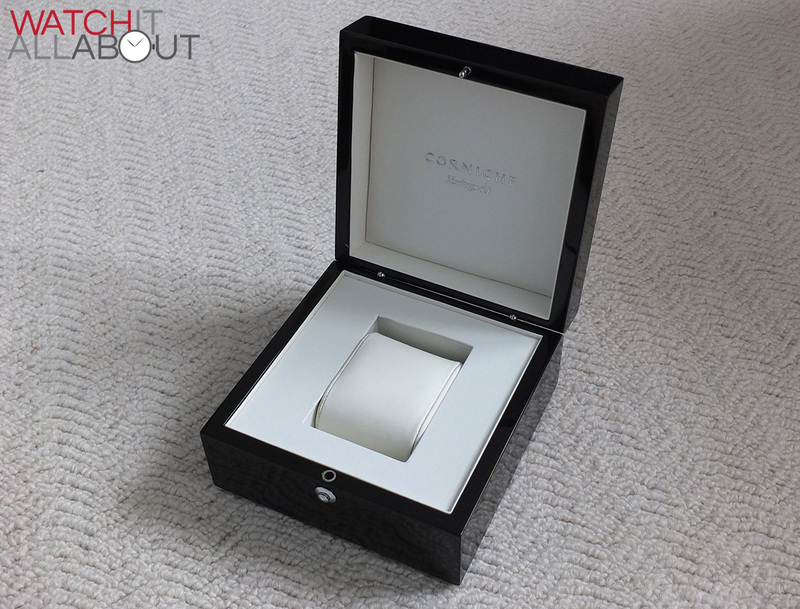 From the certificate of authenticity booklet, the velvet cover, and the piano wood finish box with chrome hinges and button, to the watch itself – it’s all the same kind of excellent quality you’d expect from a luxury brand. And that’s no joke. 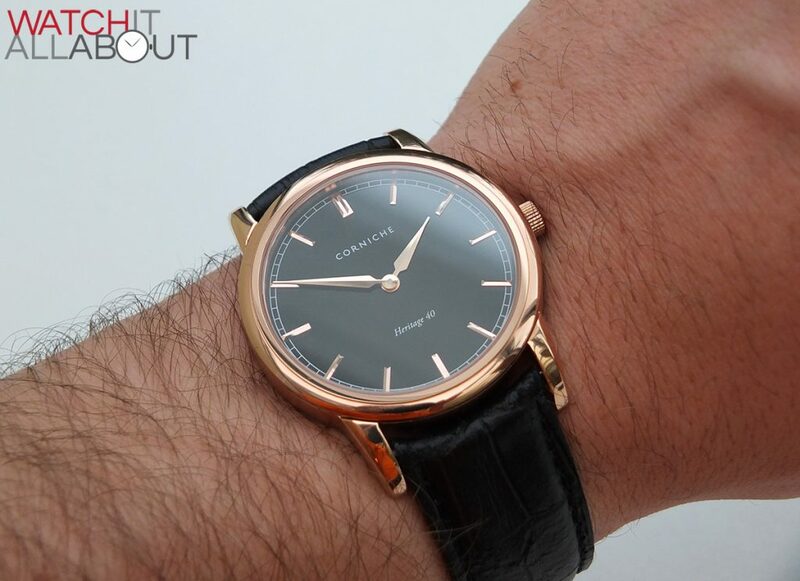 With the leather strap lug width to one side (a very minor negative), I’m extremely impressed by Corniche, and I feel that if they released a mechanical timepiece then it would be simply exceptional and a massive hit. 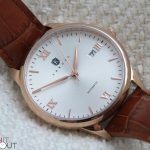 Of course, with the omission of the seconds hand, this could be a mechanical watch at a glance – you’d never really know, so that’s quite cunning of them. So would I recommend it? Completely. This is a purchase that will not disappoint one bit. I bought the very watch you have shown here. There seems to no different version for male/female and the band is too big for my wrist. I am going to try to have a new band put on because I am in love with the aesthetics of this watch. Enjoyed your review. Wish me luck! 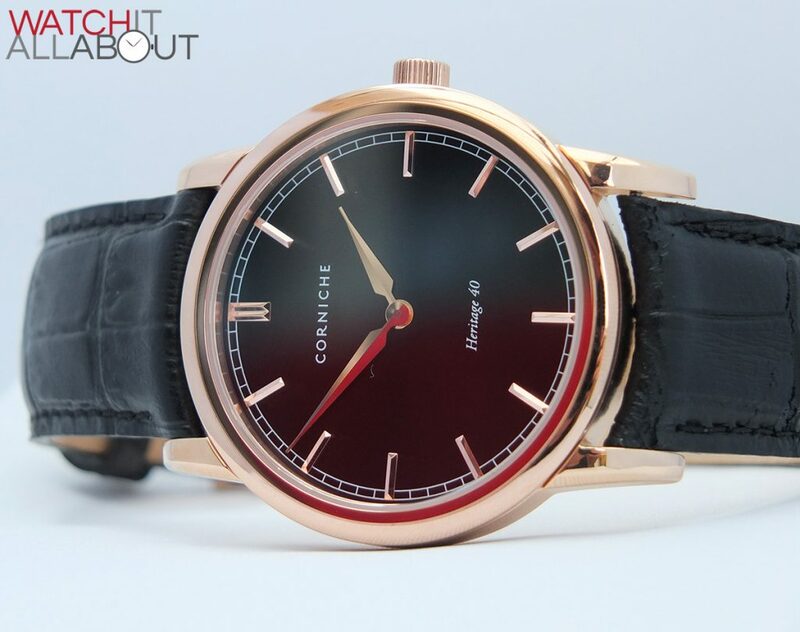 Hi I recently purchased a corniche watch but want to return it for a refund however they have been ignoring my emails and Facebook messages. Would you have any idea of what I could do please ? I purchased the brown strap/ white face version a few months ago and I’m very impressed. The blue hands are very eye catching without being garish. It goes well with a suit but would look equally at home at the bar by the beach! 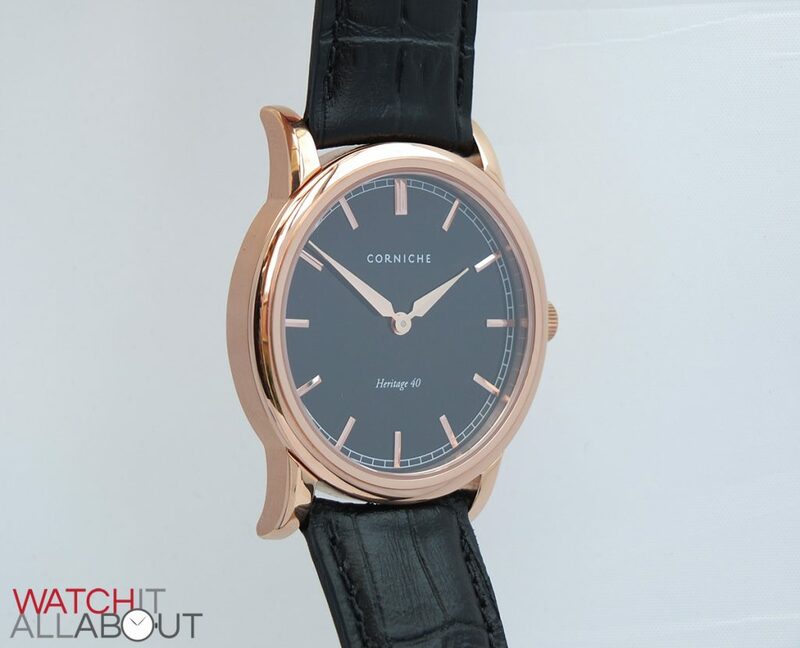 I always receive compliments on the watch and corniche have now released a midnight blue strap which might be a good option for spring. Asim I’m surprised at your lack of response, the team were very accommodating and responsive to my queries. Perhaps the holiday period is the reason for the delay?